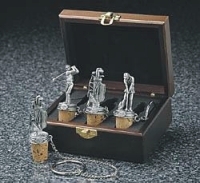 Handcrafted from pewter with natural corks, these stoppers add golf style to any collection of wine accessories. Set of three includes one each of male and female golfers, plus golf bag. Comes in wooden box with hinged lid.